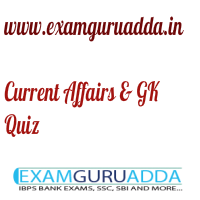 Dear Readers Examguruadda.in presents Current Affairs Quiz Questions and Answers of 1-2 April 2017 that cover important current affair events. Current Affairs quiz for IBPS PO,clerk, RRB-Po,Clerk, SBI, NIACL,Railways and SSC Exams. 1. India’s first International Centre for Foot and Mouth Disease (ICFMD) has set up in which state? 2. Which tiger reserve has become the India’s first tiger reserve to get official mascot? 4. Which country is hosting the 2nd annual meeting of New Development Bank (NDB)? 5. The biggest river festival of India “Namami Brahmaputra” has started in which state? 6. Who has been appointed the new Vice Chancellor of Nalanda University? 7. Which Indian Chief Minister has been selected for the USIBC Transformative Chief Minister (TCM) award? 8. Who has been appointed the new chairman of the Central Board of Excise and Customs (CBEC)? 9. Which city has become the first Indian city to offer 1Gbps wired broadband internet service? 10. Which country has become the world’s first country to ban metal mining nation wide?